House number 3, our latest in a string of Calgary abodes, is lovely in many respects. A nice backyard for the boys to run around in while screaming at the top of their lungs – much to our new neighbours’ chagrin, I’m sure. 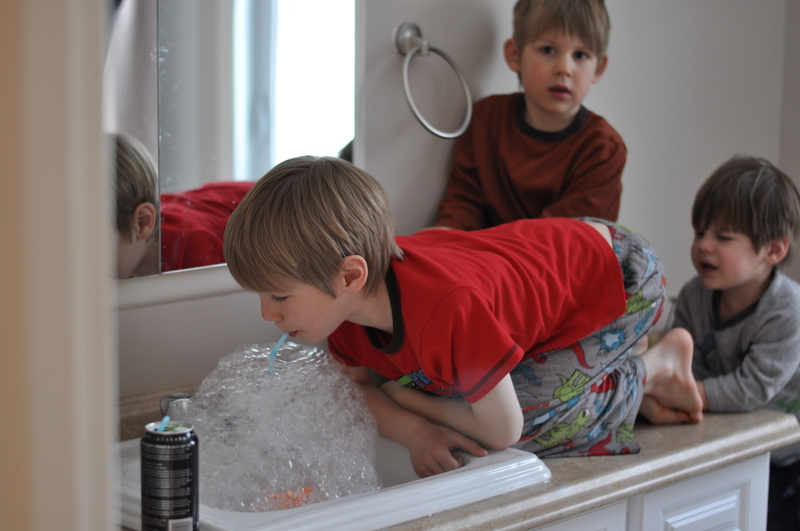 There is sufficient light in the house so as to allow me to take pictures of the boys when they’re doing ‘adorable’ things like filling the bathroom sink with water and using straws to blow bubbles. But, and there’s always a but, there’s a teensy drawback: the large basement is entirely without storage space. No closets, no shelves, just one long skinny room with greige carpet. Ta-da. ‘Do you need me to help you unpack,’ one friend asked; mildly horrified by the state of the below – brown boxes everywhere, some open, some empty, some with contents spilling onto the floor. ‘There’s nowhere to put the stuff,’ I explained, hoping to convince her we weren’t candidates for an episode of ‘Hoarders’. I turned to Kijiji, in the hopes that somebody, somewhere in southwest Calgary, was hoping to part with an assortment of storage solutions for the winter gear, books, office knickknacks and bins of Christmas decorations we seem to bring with us wherever we go. There wasn’t, as it turns out. Within five minutes of searching, I learned two things about this website where other people always seem to get great things at great prices. First, I’m convinced there are people who do nothing but stalk the website all day long, hitting refresh every 2.5 seconds and pouncing on any advertised bookshelves or other semi-attractive storage solutions. That cute red bookshelf that was listed ‘less than 12 minutes ago’? Gone. Snapped up by a Kijiji hawk. No shelf for you, unmotivated person who refuses to sit in front of a computer for days on end until the right item appears. Even if the item in question was bought…six years ago. One woman advertised her two year old IKEA sofa with the line: ‘has only been sat on twice.’ Literally. Two times. In two years. Even if the statement was remotely accurate, I do not wish to pay 90% of the original sales price for any used items from that blue and yellow warehouse. If I’m buying IKEA, I’d rather buy it brand new with the hopes of somewhat extending its no more than four years shelf life. So I gave up, after scouring ten pages’ worth of advertisements for leather couches and dining sets. 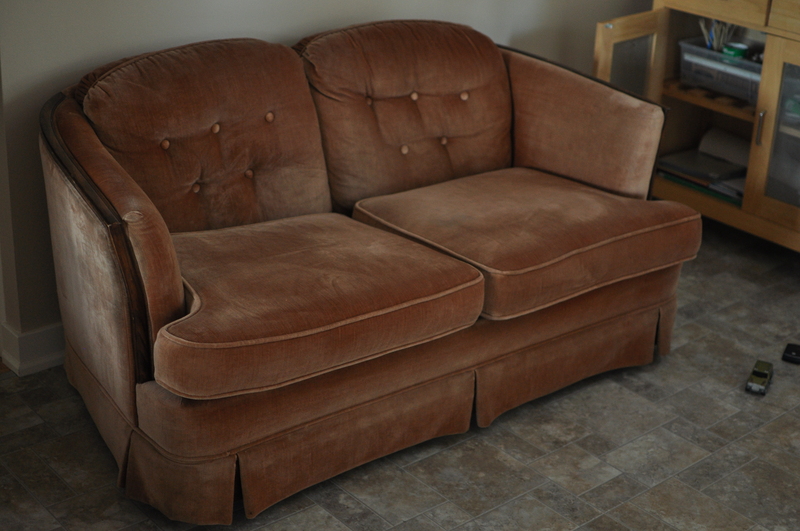 But not before my eye landed on a picture of a small velvet sofa for the low, low price of $20. I’ve been on a velvet sofa kick for a while now, faithfully pinning pictures of other people’s adorable vintage couches to my Pinterest board; swooning over airy Brooklyn apartments with exposed brick walls and green velvet encased sofas as featured on Design Sponge. He brought the brownish beige gem home with a frown upon his face. ‘One of the legs is broken,’ he announced-accused when he walked through the door. ‘It cost twenty dollars,’ I reminded him, my mind clouded with visions of the couch transformation I would oversee: re-upholster in a dusky blue velvet, remove the old-fashioned skirt around the bottom edge and add a pair of chic new legs. Never mind the fact that this would set me back considerably more than the initial $20 outlay. And by ‘considerably more’, I mean: the price of a brand new couch. Nice couch. Each time you need more storage, pick up about two couches worth of pine and hand the professor a copy of this: http://woodgears.ca/shelves/garage.html and http://woodgears.ca/storage/shelf_plans/index.html. The plans are even Canadian. I’ve been meaning to try it. Great photos and very artful analogy for the elegance of Kijiji. And your headline makes an excellent point — there’s a fine art to selling well on Kijiji and buying well for that matter. Most people do a hamfisted job and miss the good stuff, just trying to get a great deal. And to the finer point — some Ikea stuff is good to buy used….some is not. Bookshelves — never. They seem to be made to set up once and leave for good. Once you move them, they never seem square again. Oh my word your boys are all so handsome!! And so big! Thanks Ashley! Shawn, I agree with Jason – you could bring your Aeropress and we can have contests to see which brewing method is the best.